When it comes to all things Android myself and a few others are all in, we live to read about the latest devices and scour spec sheets and fawn over designs and anything and everything else in between. But we also know that many others don’t and some prefer avoiding some of the sites where such info can be found (coughGizmodocough), so we share what we can as we can on here and today’s no different. Someone messaged me asking if I’d do a write-up for the devices announced today and now that I’ve read up on them I can share what info is relevant and worth knowing with the rest of you. 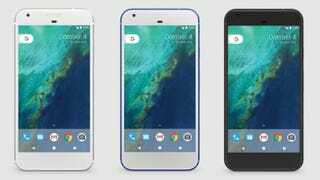 Today marks the death of the Nexus line of phones, in its place comes the Pixel. The Pixel is Google’s first truly premium smartphone in every sense of the word and I’ll explain why momentarily. Previously if you wanted fully stock Android, timely updates, and a good phone at a reasonable price (although only two devices were ever released at a “cheap price”, the Nexus 4 and Nexus 5) you bought a Nexus. Nexus phones were phones created by various OEMs (HTC, Samsung, LG, Motorola) at Google’s behest and their purpose was essentially to show what Android could do and how it should be. But like with all such things Google eventually decided it was time to run the show from top to bottom and do away with minimal input on its devices, which is why we now have the Pixel. Some of that went by too fast so I’ve taken the liberty of snagging some spec screenshots from Android Police’s post on the phones. As far as specs goes these are the best of the best, nothing else matches them and that’s not an exaggeration. Even the latest flagship devices from Samsung, LG, and others are lagging behind. Well, at least in regards to the chip used to run everything (Snapdragon 820 for everyone else) and the version of Android out of the box (Android Marshmallow 6.0 for everyone else). What other devices won’t get until next year you’ll have out of the box with these two. But you get plenty of extras briefly touched upon in the video shared up above. No flagship launch would be complete without offering a device in a variety of color options. Think what you will about the names of the colors but I personally find them amusing and that Quite Black has my name written all over it. See, it even has the G on there. G for George, I won’t hear a word otherwise! Then again I don’t need to say more, because DXO has already released their review of its camera and the highlight can be seen in the picture above. “It has the best smartphone camera.” Those words aren’t said lightly, that’s in comparison to the recently released iPhone 7, Samsung Galaxy S7, and HTC 10. What’s the point of using the best camera on a smartphone if you run out of storage space using it though, right? Well, a year or so back Google announced that you could upload photos and videos to Google Photos and do so in either “high quality” (which used compression to upload high quality copies with almost no discernible loss in quality to the average eye) or “original quality” (which counted against your Google Drive storage space. This year it seems like Google is kicking things up a notch. BAM! Original quality for all Pixel owners. Shoot 4k video on your phone? It’ll upload in 4k uncompressed quality. Woe to those who love uploading things on the go if they don’t have unlimited data, to the nearest WiFi for you! Knowing that some of you out there were disappointed by the iPhone 7's lack of a 3.5mm headphone port and are considering jumping ship to Android it’s important to note that doing so has never been easier. Google is including an On-The-Go (OTG) adapter they’re referring to as a “Quick Switch Adapter” that will allow you to plug your iPhone (provided you are running iOS 8 or higher) or Android device (provided you are running Android Lollipop 5.0 or higher) into it and easily transfer your data. Just sign into your Google account on your Pixel and then decide what you want to copy over: Contacts, calendar events, photos, videos, music, iMessages, SMS messages, etc, etc, etc. iOS users please note that you must remember to turn off iMessage and Facetime via the respective settings menus for both in order to avoid any issues, you must do both those things before transferring your SIM card to your Pixel and doing the data transfer. And now for some carrier specific information regarding the phones, the phones will feature WiFi calling but it will at launch be exclusive to T-Mobile and Verizon. The chance for expansion via other carriers is there but naturally that’s dependent more on the carriers than Google and we all know the nonsense that carriers bring to the table. Naturally there’s also some Verizon exclusive news which may or may not make you want to set yourself on fire. Unfortunately, for those who care about such things the devices will not have unlockable bootloaders if you go with the Verizon sold versions. This was confirmed by Android Police at the Pixel event held earlier today. However, if you purchase directly from Google you will have unlockable bootloaders and they will be compatible with Verizon’s network. So if tinkering with Nexus devices is your jam and you’re with Verizon then you know who you have to get your phone from. For those unfamiliar with jcase he’s an XDA developer who is known for releasing all kinds of goodies to help make our phones our own and evleaks is known for leaking anything and everything regarding future devices with few misses in that regard. And really that’s all there is to know regarding the new devices. Oh, price, duh. Prices for the devices are as follows. I should point out that there were a few other devices announced today as well, but I’ve decided to cover those as a separate post which I’ll share with you all tomorrow. Additionally I’ll likely update this post with some more info later this evening or tomorrow, but I figured I’d cover the more important stuff right off the bat. Questions, comments, etc? Leave them below! Myself and some of the others all up on today’s reveal will be more than happy to reply.